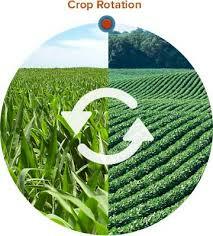 Crop rotation is the practice of growing a series of different types of crops in the same area in sequential seasons. Crop rotation gives various nutrients to the soil. A traditional element of crop rotation is the replenishment of nitrogen through the use of green manure in sequence with cereals and other crops. Crop rotation also mitigates the build-up of pathogens and pests that often occurs when one species is continuously cropped, and can also improve soil structure and fertility by alternating deep-rooted and shallow-rooted plants. Crop rotation has increased in the south in the last 10 years due to the changing tides of the ever changing grain price. With the increase in corn acres across the south, as well as the increase in irrigation, we have seen a steady increase in yields. There are many studies showing yield increases of 10 to 15 percent in soybeans and corn when rotation is utilized. Rotations also help with a reduction in nematodes, weeds and diseases. Northern Leaf Blight is a good example of a disease that has increased over the last several years, and can be reduced by rotating corn and soybeans. The incremental increase in N use over the past five decades, due to emphasis on maximizing yield, has led to a subsequent increase in N in the soil profile of some agricultural fields. Therefore, the influence of agricultural practices on water quality has prompted studies to develop best management practices to optimize the use of fertilizer N and reduce N loss to surface and groundwater. 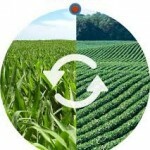 Crop rotation can play a major role in minimizing the potential risk of nitrate leaching to surface and groundwater by enhancing soil N availability, reducing the amount of N fertilizer applied, and minimizing the potential risk of N leaching. Research on the impact of long-term crop rotation on soil N availability shows that planting alfalfa, corn, oat, and soybean significantly increased the mineralized net N in soil compared with planting continuous corn. Because soil N mineralization can effect yield, crop rotation thus can be used as a management system to enhance the soil nutrient pool, thereby reducing the fertilizer N input and minimizing the risk of leaching of excess N during wet weather. A combination of conservation tillage practices and crop rotation has been shown to be very effective in improving soil physical properties. Long-term studies in the Midwest indicate that corn-soybean rotation improves yield potential of no-till compared with continuous corn. The reduction in yield of continuous corn in no-till is attributed to low soil temperature during seed germination, which is evident on poorly drained soils under no-till. Studies show that the poor performance of no-till corn following corn is more likely due to the previous crop than to surface residue conditions preventing early-season warming and drying of soils. The use of a legume cover in crop rotation can provide a substantial amount of N to a succeeding crop. Research has indicated that seeding rates for legumes can be reduced by approximately one-third of that recommended for forage production when used as cover crops without sacrificing biomass or N accumulation. Also, the type of crop grown in the previous year can impact the efficiency of conservation tillage, especially for no-till systems, due to the kind and amount of crop residue from the previous crop.